In research just published in Ecological Applications, researchers Joel Pitt and Sue Worner, members of the Lincoln University’s Bio-Protection Research Centre, and their colleague Andrew Suarez from University of Illinois, Urbana, have created models that allow greater accuracy in examining how Argentine ants spread around the landscape. The researchers were frustrated that most existing models only dealt with an abstract environment that was all of one type which helped with the mathematics of the model but was very unrealistic. The team decided to use a GIS approach to include realistic landscape information, such as land cover and local temperature, in their models. A simulation was run for each year from 1990-2005 to look at where the ants would move to and likely survive. What they found was that the simple model assuming a similar landscape was actually quite accurate for the first few years of the invasion. The more complicated model started to perform better after a few years and was reasonably accurate with its predictions when we look at actual spread in 2005 (predicting hotspots of activity in Auckland, Hamilton, Whangerei, Great Barrier Island and Tiri Matangi Island). 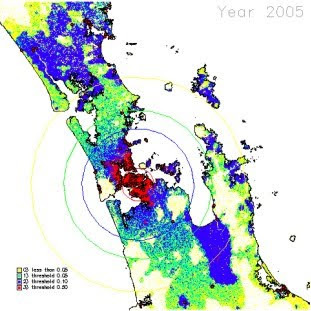 The figure above shows the areas potentially able to be colonised by 2005 predicted by the simple model (circular lines), the complicated model (colours) and what actually happened (red dots - look closely, they are hard to spot away from Auckland!). The success of this approach will allow managers to better target their resources into monitoring areas that are most likely to be invaded.